Oh well, today I suppose back to home earlier but due of some problem happens so I just arrive back to my home. Oh ya.... Hi and welcome to my blog!! This post will be an expressions blog. I just want to share out how actually how fail am I!?!? Okay!! After that time, I found that I am definitely a noobie driver. I just know how to start engine and drive on the road!! That's all!!! Damn!!! From now start on, I should know more about the car knowledge not only just start on and off and drive on the road. This case will be repeated again if I still in the same of car acknowledgement. 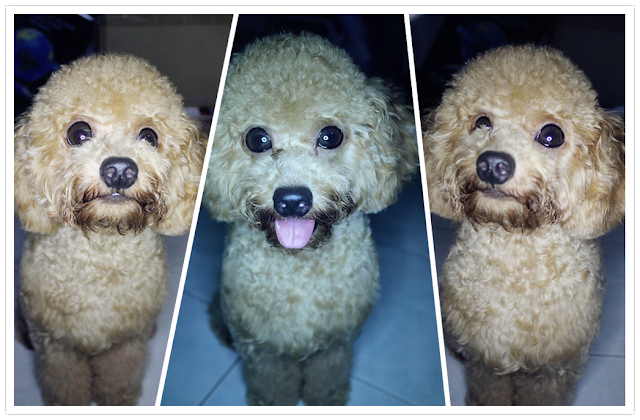 Handsome, my little fat doggie had his new style here. He looks rounder and fatter with this look but he is so cute and adorable enough.